Meet Tommy the Turtle and his fish friends. 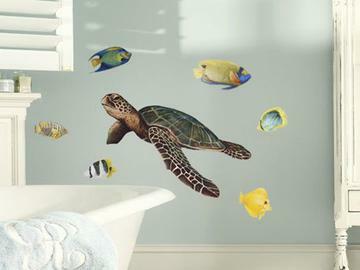 Our gentle sea turtle and all the fish are a perfect addition to any underwater themed room. The detail in this design is amazing from Tommy's friendly eyes to his worn shell! Have fun placing all of the fish swimming around Tommy. All species of sea turtles are listed as threatened or endangered, that makes Tommy a little extra special to us and we hope he brings as much joy to you.